On our last day in Kazakhstan we birders traveled hundreds of kilometers to the east of Almaty in order to explore the desert environment there. 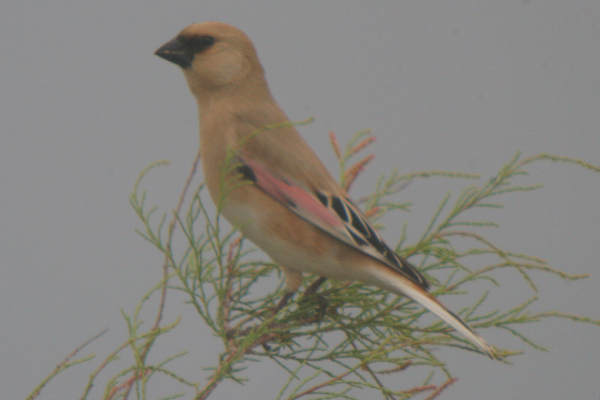 And while many birds were viewed, none were quite as fascinating to me as the two pink-winged finches we spotted, the Desert Finch and the Mongolian Finch. This post, of course focuses on the Desert Finch, which is unusual in that everyone seems to agree on its common name, though some call it Lichtenstein’s Desert Finch, but its scientific name is the subject of much controversy. Birds of Europe, Russia, China and Japan (part of the Princeton Illustrated Checklist series) calls it Rhodopechys obsoleta, while The Birds of Kazakhstan calls it Rhodospiza obsoleta, BirdLife International calls in Rhodopechys obsoletus, and Wikipedia calls the bird Carduelis obsoleta and also notes that it has been placed in Fringilla and Bucanetes as well. To be honest, I don’t really care about the taxonomy of the bird so much as I care about how freaking cool it looked at a waterhole in the desert! Pink wings! The bird in the pictures above and below is a male, given away by the black lores. 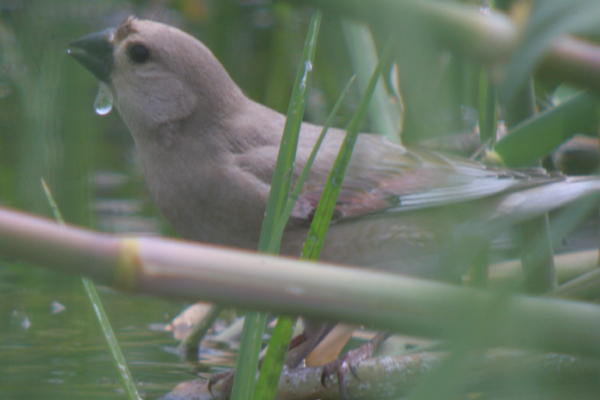 The finches were very flighty, and the only reason that we got the pictures we did was because we were set up next to a waterhole where the birds wanted to drink. We were not the only creature perceived as a threat waiting at the waterhole: an Isabelline Shrike was waiting to ambush the unwary there as well. Fortunately for the finches, the shrike did not strike and we were only seeking photographs. Watching these finches fly in as pairs, perch briefly, and fly off giving a call note described in one field guide as a “sharp shreep” was fun. Actually getting a usable though partly obscured shot of the female when she overcame her trepidation and flew down for a drink? Marvelous! Desert Finches are a species of least concern according to BirdLife International and enjoy a relatively large range in southern Eurasia. According to Wikipedia they are found in deserts only near a reliable water supply, and are otherwise found in foothills, low mountains and cultivated valleys. It is certainly a relief to know that such a superb-looking species is not threatened with extinction any time soon and I hope someday I manage to get back to the region to enjoy their presence again! This post has been submitted to Bird Photography Weekly #38. Go check it out! Thankyou Corey for the beautiful photos of this finch. Just wonderful. Beautiful bird and beautiful photos! Oh man, Will totally stole my line. Awesome bird! With all of those different names, you should count it once per name. Lovely pink! How many birds do you see with pink like that? I imagine not many..great shots! …beautiful bird. I love the faint wash of color on the wings (and the water droplet you captured). Sadly we don’t get these in Europe, just parts of the Middle East to Central Asia. Oh well, I won’t complain. At least we have our Phylloscopus and Acrocephalus warblers in Europe to keep us entertained. Wow!, what a beautiful bird, thanks for sharing him. Awesome captures Cory. The first shot of the male, and the female at the water are amazing. The shot of the female, looking through the grass, makes me feel like I’m there. Thanks for your pictures! From them I was able to identify the bird I saw in my back yard today. Yes, I definitely saw a Desert Finch in Jonesboro, Arkansas. It was eating with a number of Northern Cardinals, American Goldfinches, and house finches in a tray. Wish I could capture a photo, but the tray is too far away for my camera lens. Thanks again for your help. 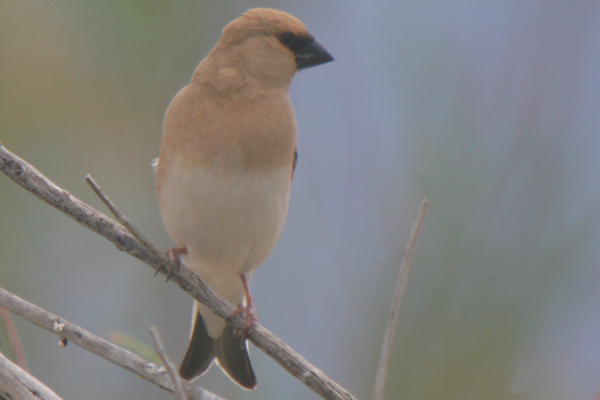 @K Roe: You almost certainly do not have a Desert Finch in your backyard in Arkansas. Much more likely (though still pretty unlikely) would be one of the three North American rosy-finches (Black, Gray-crowned, and Brown-capped). I would say to go ahead and try to get even a lousy photo and we here at 10,000 Birds can try to help you ID it. Afew of them were sent to me from Germany labled “bullfinches”. this was before the quarantining of all birds went into efffect. I haD NO IDEA WHAT THEY WERE AND THE GERMAN WHO SENT THEM OBVIOUSLY DIDN’T KNOW EITHER. I SOLD ALL OF THE BEFORE I HAD A PC AND WAS UNABLE TO LOOK THEM UP. i WOULD LIKE TO KNOW IF THEY HAVE A SONG AND WHAT IT IS. 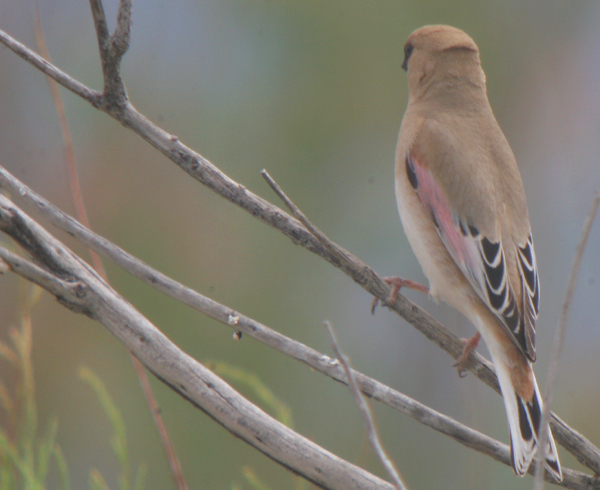 With reguards to Corey in Arkansas, You may have actually seen a Desert Finch, an escapee. I am in San Diego and bought a pair in Oct 2011 and after not being able to sell them I set them up for breeding In Jan 2012 . Did not know what to use for nest so put both a large finch box and a Canary nest with a knit liner. they did not like any nesting material but did lay 6 small eggs, and hatched 2 babies in the Canary nest. The 2 young are now almost as large as the parents and doing great. The cage is 28″x36″x36″. Ilike their song and will probably get 2 more to breed with the babies when ready. some were sent to me as bullfinches from Germany. I never heard them sing because I gave them all away.